So last Thursday I went down to Portland to be interviewed for a new interpretive film for Whitman Mission National Monument. My involvement with the project began back in January when I was contacted by a scriptwriter who was working up a treatment for the film. She had visited the monument and asked what to read and apparently someone handed her my book. We spoke on the phone two or three times. I was impressed by the thoughtfulness and research that were going into the production. So when they asked me to be one of the talking heads in the film I was happy to agree. They sent me the questions in advance--seven pages of them! 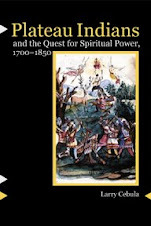 I discovered that there was a lot I had forgotten since my book came out in 2004. I wasn't sure how to prepare. For each question I tried to come up with a sound bite and a longer set of talking points. The filming was done at the Old Scots Church, a historic 1870s church outside of Portland. It is beautiful. The filming was interesting and a new experience for me. In many ways it was like a conversation, except that periodically the interviewer would ask me to repeat something because a truck went by outside or because I looked at the camera. For the first couple of questions I gave my long answers, and was diplomatically asked if I couldn't be a bit more concise? So from there on I gave my sound bite answers and they seemed to like that. All in all it was probably a fairly standard interview--except for when it got strange. Joe Meek knew how to hang an Indian. The recently appointed Marshall of Oregon knew as much about the natives as any man in the territory. As a mountain man he had lived among Indians for most of his adult life. Meek traded with Indians, he played their games, shared their prayers, wintered in their lodges, and had taken not one but two native wives. He had killed Indians as well--sometimes as a member of a native war party, sometimes in self-defense, and sometimes for the fun and frivolity of killing. But as the fur trade faded in the 1840s, Meek abandoned the free life of the mountains and moved to the Willamette Valley to try his hand at farming. When the burgeoning American settlement there needed a law officer, Meek was only too glad to exchange his plow for a badge. As he climbed the gallows that day in 1850, Meek was turning his back on his old way of life and returning to the fold of American civilization. How weird is that? What are the odds? A chill ran down my back. And I went back inside and did the rest of the interview--what else to do? That night I kept expecting a supernatural visitor, but apparently ghosts can't travel very far at night. A Google Map of Lame City Slogans. Prairie du Chien, ""Where the bald eagle soars and the carp drops!" In Richmond they are peeling the asphalt off a parking lot to restore a slave burial ground. An exhibit at Halifax’s Maritime Museum explores gay life at sea after WW2. I was interviewed for this story about Joplin, Missouri, where I used to teach. My friends there are all safe though some lost their homes. "Without good metadata . . . archives are as good as closed to many students and scholars." But can a game really change that? TAH Program Endangered Again - Please Act! It has been a roller coaster few weeks for the Teaching American History grant program. Last month, after a long fight, the House and Senate agreed to include the program in the compromise budget--though they reduced the program from $119 million in fiscal 2010 to $46 million in the current budget year. Legislation has been introduced in the House of Representatives that would eliminate the Teaching American History (TAH) grants program at the U.S. Department of Education. NCPH and the National Coalition for History urge you to contact your Member of Congress immediately to oppose this bill. H.R. 1891, the "Setting New Priorities in Education Spending Act," would terminate forty-three K-12 federal education programs. The President's fiscal year 2012 budget request for the Department of Education would eliminate Teaching American History grants (TAH) as a separately funded program. However, the Administration proposed consolidating history education into a new program called Effective Teaching and Learning for a Well-Rounded Education. This reflects the President's Elementary and Secondary Education Act (ESEA) reauthorization proposal, the Blueprint for Reform, which was released in March 2010. Teaching American History grants is the only federal program that funds K-12 history education. Its elimination would exacerbate the problem of local school districts de-emphasizing history in their curriculum because it is not the focus of high-stakes testing. The House Education and the Workforce Committee is expected to consider H.R. 1891 at any time. It is important that you contact your Member of the House of Representatives TODAY, to urge them to oppose this bill. The National Coalition for History is working with the National Humanities Alliance, which has set up a template message for you to customize. We strongly encourage you to personalize this message by telling Congress why TAH programs are important to you, your institution, your field, your state, and/or district. A heads-up to my readers in the public schools: Google For Educators: "The Google Teacher Academy is a FREE professional development experience designed to help primary and secondary educators from around the globe get the most from innovative technologies." I wish I could apply to this event but it is for K-12 teachers only. The teacher academy is part of the larger Google for Educators initiative, which includes classroom tools, activities, and what looks to be a pretty active teacher discussion group. The first thing I did in my digital history course this quarter was to make every student get a Gmail address so as to unlock the other free Google resources, and every week we use Google tools from Blogger to Google Earth to Picasa to a dozen other resources. It would be fun to attend a Google-run workshop to pick up some tips on bringing it all together. 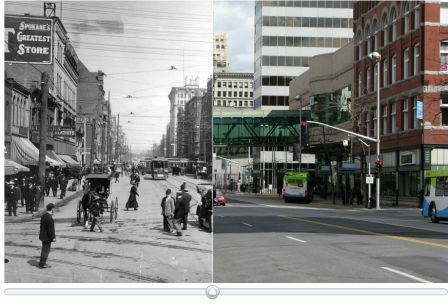 Riverside Avenue in 1909 and Today--where did all the people go? Our local newspaper has been dipping into its archives for content more and more lately. It is a welcome trend for local historians. The latest offering is Bricks of the Past - A Then & Now gallery. Readers of this blog now what a sucker I am for rephotography projects, and this one is very nicely presented, with a slider bar at the bottom of each image to shift between past and present. Does anyone know what software they used to do this? 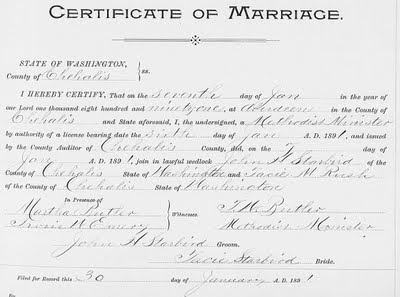 A young Spokane woman was “slapped by Cupid,” as the Spokane Daily Chronicle put it – and it all worked out for the romantic best. The young Miss King was invited to stay for dinner with Starbird and his niece. Afterward, he offered to drive her home in his automobile, with his housekeeper as chaperone. At a railroad crossing, “Cupid got his chance,” said the Chronicle. Starbird failed to see the wooden crossing-guard arm descending. The arm fell across the open car and hit Miss King right in the head, knocking her out. Starbird turned the car around, raced for home and called a physician and nurse. She recovered after a few days, but meanwhile, Starbird had fallen in love with her. She and Starbird went to the courthouse for a marriage license and on to the church where they were married. 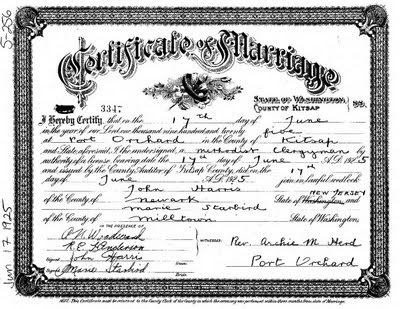 Kershner does a nice job selecting old stories, but never does the follow-up research to answer such natural questions as: Did the couple live happily ever after? 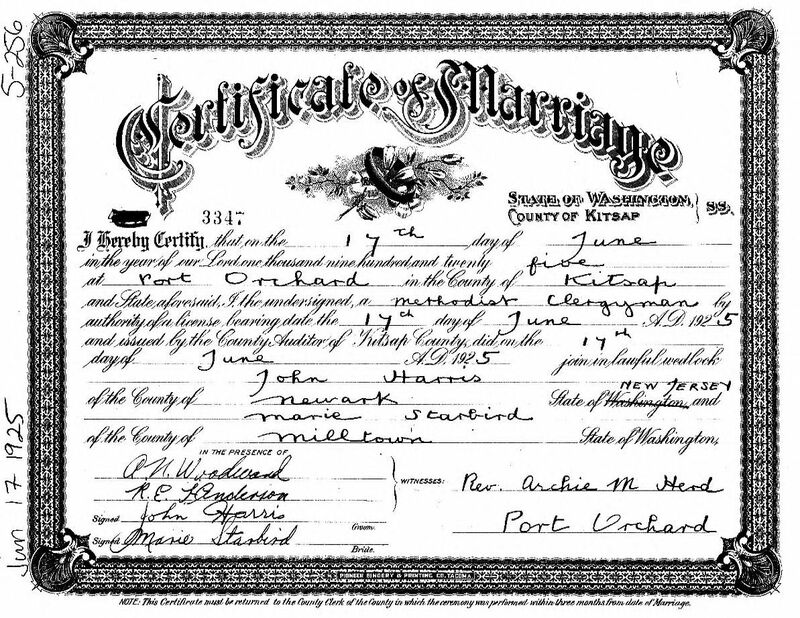 In 1925 John Starbird was married in Port Orchard for a fourth time to a Marie Starbird! I am stumped. 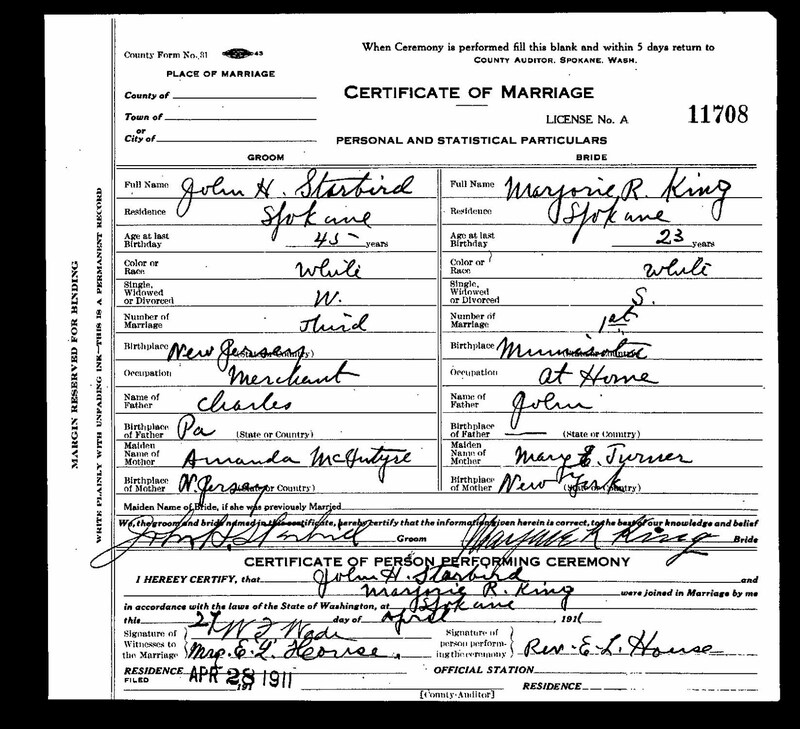 Did Starbird divorce Marjorie, marry Marie, and sometime before his death divorce Marie and remarry Marjorie? 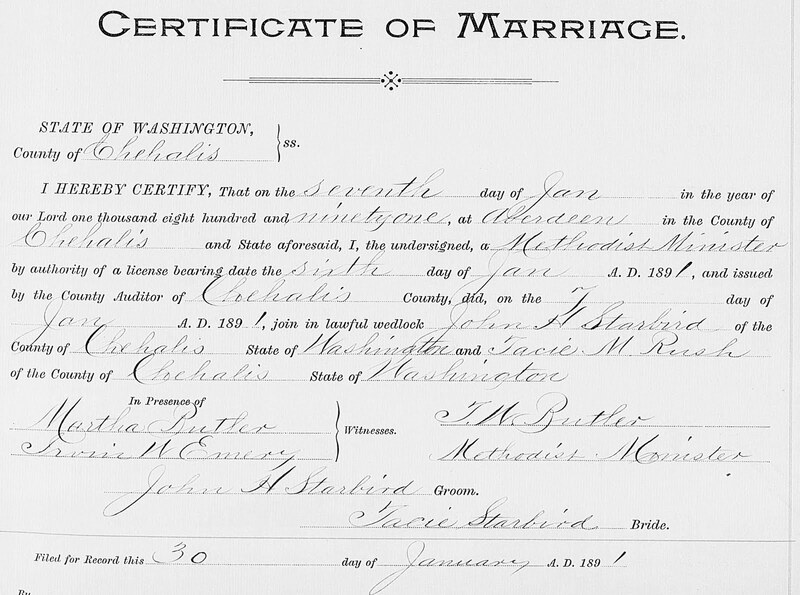 Was he a bigamist, with a wife on either side of Puget Sound? Or are Marie and Marjorie the same woman, and at some point it became necessary to renew their vows? 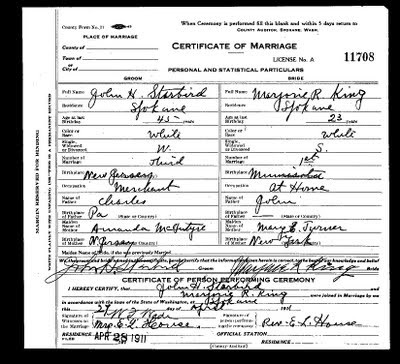 The latter seems the most simple explanation, except for the fact that a Marie Starbird was married two years earlier, in 1923, to Elton E. Morehouse. So they are different women. Any ideas?